2014 Historic Preservation Days | Waukesha Preservation Alliance, Inc.
Waukesha Preservation Alliance, along with many other partner organizations, is proud to host Historic Preservation Days on Saturday, May 17 and Sunday, May 18, 2014. This annual event brings local history to life for all ages. Saturday’s events include historic walking tours, a guided springs tour, an antique vehicle display, and an opportunity to view and learn the history of Silurian spring. The Waukesha County Museum will host an open house of its exhibits. Special events include an Introduction to Tea, as well as a historic brewery memorabilia display inside a local brewery. On Sunday, open houses of historic homes will be offered. The majority of events are free. 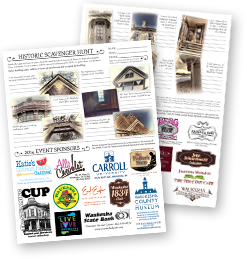 New this year is a Historic Photo Scavenger Hunt Contest, where participants will search through the historic sections of our City to locate small details of buildings. All correct entries will be entered in a drawing to win prizes from our sponsors! Click here to download the 2014 Scavenger Hunt (1.4mb PDF). Please note, only one entry per household. Submit all entries to the Waukesha Preservation Alliance tent at the Antique Car Exhibit on Saturday 5/17/2014, or mail to Waukesha Preservation Alliance, P.O. Box 1862, Waukesha, WI 53187. All entries must be received by 5/26/2014. All participants under the age of 18 must list the contact information of a legal guardian. For a complete schedule of this years events, click here to download the 2014 Event Guidebook (2.28mb PDF). The guidebook contains times and locations for all events. Note: To view and print PDF files, you must have Adobe® Reader® installed on your computer. Most computers already have this software installed, if yours does not, you can download Adobe Reader free from the Adobe Web site (get.adobe.com).